Spiny-Leaf Saxifrage is easily distinguished by its numerous narrow-lanceshaped rigid spine-tipped leaves arranged regularly on long stems, with single golden yellow flower at the end of the stem. 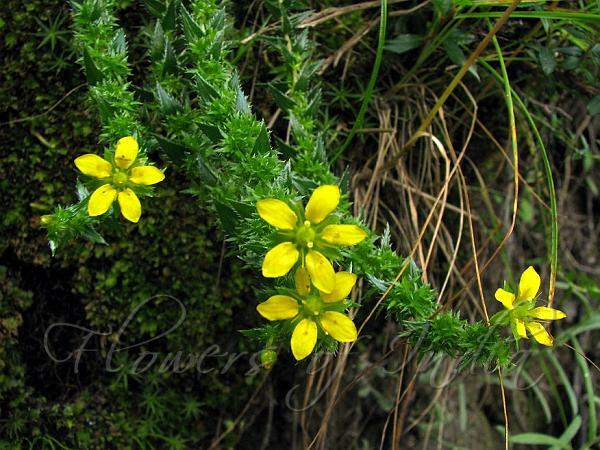 The flower-stalk is short and glandular hairy. Petals are obovate or elliptic-ovate, much longer than the ovate pointed glandular sepals. Anthers are reddish. Leaves are 5-9 mm long, half clasping the stem, densely overlapping, often wpiny-toothed margins. Stems are many, often forming a moss-like clump. 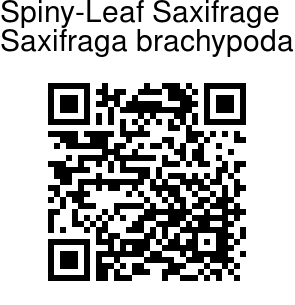 Spiny-Leaf Saxifrage is found in the Haimalayas, from Uttarakhand to SW China, at altitudes of 3000-4800 m. Flowering: July-August.